We might laugh today at some of the amulets and talisman that protected royalty, but they were cherished and extremely costly objects hundreds of years ago. Here are a few of the lucky charms used by some of my favorite royals. Catherine de Medici was one of the most superstitious queens of her day and even showed a natural talent for alchemy and astrology. 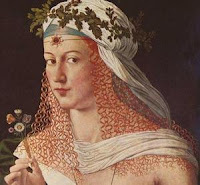 Catherine's most famous talisman was her love talisman made from metals melted during favorable astrological signs and then mixed with human and goat blood. Catherine’s love talisman was destroyed when she died, but a copy can be found at the Bibliotheque nationale de France. The above is a copy which can be purchased at Esoteric Jewels. Unfortunately, Catherine’s love talisman failed her miserably. 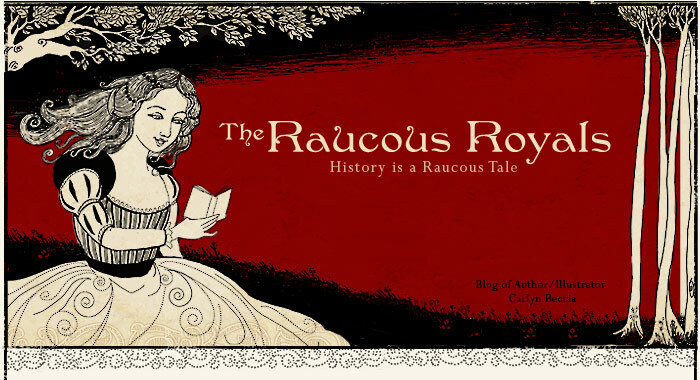 Throughout her marriage, she was trapped in a painful love triangle between herself, her husband, Henri II and his famed mistress, Diane de Poitiers. 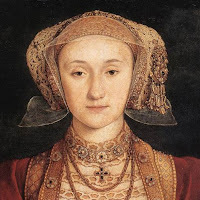 Anne of Cleves wore a crown of rosemary on her wedding day because it was believed to be a love charm. 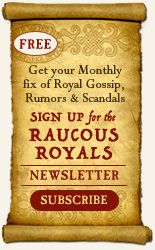 Judging by the speed at which Henry VIII divorced her, expectant brides might want to forgo this tradition. You wouldn’t think the hard-nosed, pragmatic queen Bess would dabble in superstitions, but Elizabeth I had her share of protective amulets. She possessed an agate amulet which promised that she would always have at least one faithful friend. This amulet obviously worked because Elizabeth had a knack for surrounding herself with loyal advisors and spymasters throughout her life. 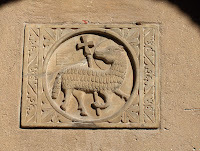 A commonly worn religious talisman was that of the Agnus Dei portraying a flag and Jesus as the sacrificial lamb. The Agnus Dei was often made from the wax of a Paschal candle and was blessed by the Pope. It was carried to protect against flood, thunderstorms, windstorms and sudden death. 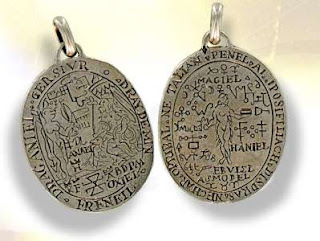 Mary Queen of Scots possessed two talisman stamped with the Agnus Dei and even took one to her execution. If you count a swinging ax as a sudden death, then this one didn’t work so well for Mary. Henry VII also possessed a serpent’s tongue on a chain to protect him from sudden poisoning and illnesses. In ancient Malta, located off the coast of Italy, serpent’s tongue were believed to be the tongue of snakes that had been turned to stone. (They were really fossilized shark’s teeth.) 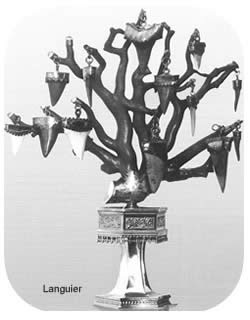 In the fifteenth and sixteenth century, serpent’s tongues were suspended from coral trees, called languiers, and placed at the dinner table. Guests would grab a tongue and dip it into their wine to protect them from poisoning. Try this amulet only if you are dining with some suspicious house guests. If you couldn’t afford a unicorn horn, then you would have to settle for carrying a mole's foot in your pocket. (just slightly nastier than a rabbit's foot.) This superstition was recommended by Pliny the Elder in the first century C.E. and continued to be a common practice in England up until the 20th century. To cure toothache, people often carried a tooth-shaped stone or animal tooth. These amulets cured tooth ache by transferring the disease from your tooth onto the stone. If you squeezed it pretty hard, maybe you would forget about the stabbing pain in your jaw. 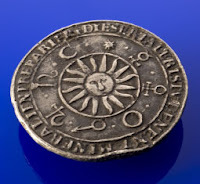 Another common amulet was an alchemy coin called a ‘thaler’ which when carried would protect against disease and illness. The word ‘thaler’ became the basis for the word dollar which today ironically transfers nasty germs instead of protecting against illness. Stay tuned for a future post on the talisman used in divination. Shown here is the purple crystal used to cure illness and predict the future. It was used by Elizabeth I's conjurer, John Dee who claimed he could see ghosts in it. What is your favorite lucky charm? Fess up….are you superstitious? Do you consult the magic eight ball before making any important decisions? Do you have a florescent pink rabbit’s foot hanging from your dashboard or a lucky rock in your pocket? Kidwell, Carol. Pietro Bembo: Lover, Linguist, Cardinal. Montreal, Quebec: McGill-Queen's University Press, 2004. The Execution of Mary Queen of Scots. Starkey, David. The Six Wives of Henry VIII. New York, NY: Harper Perennial, 2004. If someone had asked me a year ago if I were superstitious, I would have answered NO. However, after reading Bernard Cornwell's Saxon series, I asked for and received a Thor's Hammer amulet necklace for Christmas. I love it, and wear it, every time I drive more than a block or so away from home. As I merge with traffic on the interstate, I always reach for it and give it a slight rub. I don't really think it brings me luck, but it does bring me a bit of comfort. Does this make me superstitious? or does it just paint me as a real fan of Cornwell's Uhtred?? Not a real unicorn horn? Shocking. Well, I don't think I'm superstitious- but then I am of Italian origin...so growing up we usually always wore certain charms around our gold chains; either a little gold horn, a dolphin- and absolutely our cross. My hubby is of Greek origin and they usually like to wear the blue eye (to ward off the evil eye). Nowadays I don't think it's really for superstitious reasons but just cause we're so used to it?.. I'm not superstitious at all- There are so many of them, and half of one culture's superstitions contradict the other culture's...it seems like something that would add stress rather than take it away. At the local SPCA they had ad special on adopting black cats- only 10$! The lady said that no one wanted them because people think they're bad luck. That's just sad! No i'm not supertsticious anymore, thanks to all of my classes at school (i'm studying psychology! That's called magical thinking. Amulets don't work really but they do give people peace of mind. Thanks for the post, interesting as always! I'm a little bit superstitious, but it do not rule my life, and I don't have an amulet or something like that. "To cure toothache, people often carried a tooth-shaped stone or animal tooth. These amulets cured tooth ache by transferring the disease from your tooth onto the stone." I've heard stories about the deeds of wise men - and women back in the old times Sweden (maybe this ritual existed elsewere as well, but that's out of my knowlege). They belived that the toothache could be cured by saying some magical words, which transfered the pain into a nail, and afterwards they took the nail outside to hammer it into a tree. Voilà! No worries anymore, because the tree got all your toothache instead of you. Clever eh? I have lucky underwear that I've used for all my final exams at university. (Of course: after each exam I washed it!). I never failed an exam. But otherwise, I'm totally OK! And hullo to Ms. Lucy! Greetings from the North of Italy, my kinsplace! I'm Italian-Irish, so superstition flows freely through my veins. I never, never, never used to leave my house without my Trinity knot necklace. When it was stolen by an ex boyfriend who promptly "lost" it, I got a Trinity knot tattooed on my arm so I would "never leave home without it." I sewed a Trinity knot onto my daughter's baby blanket, own Trinity knot earrings, rings and a brand new necklace. My husband snickers at me--but he wears the same outfit every Sunday during football seasons so his beloved Philadelphia Eagles won't lose. It's funny to hear everyone's superstitions because I am soooo superstitious. I still knock on wood and I have several lucky amulets that I travel with. Linda - I have not read Bernard Cornwell's Saxon series but I love Thor's Hammer amulets and wish I had one. Ms. Lucy- I still never go anywhere without my cross. Sara- That is really sad about black cats not being adopted. I am not that bad...I would own a black cat. LadyAugstaFredrika – Have you heard of transference? That is the belief that you can transfer the illness onto another object. There is a whole list of funny ones listed on http://www.folkmed.ucla.edu/. 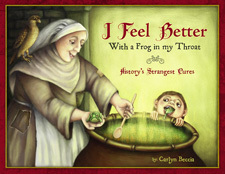 Can you imagine wrapping a dried frog around your little one’s throat to cure a sore throat. Ick! Anne Sophie - someone logical to knock some sense into me! But I still can't help being superstitious. Amy – I am Italian-Irish too so I have always worn Trinity knot jewelry but my Italian side makes me deathly afraid of the dreaded evil eye. For you Napoleon & Josephine fans...the quest is to locate some information about Napoleon's Talisman of the Crystal Sphinx. Can ANYONE find some writings from historic records of this? I considered it weird way of toothache cure! And I'm really wondering how it cure a toothache by using a stone?